To attract mountain bikers from throughout the country to Northwest Arkansas, regional planners adhered to a simple philosophy: Play dirty. More than 300 miles of soft-surface, single-track trails crisscross the region and double that is being planned. The region has become a major destination for bikers who prefer mud, rocks and hair-raising downhill riding. Andy Williamson, program director for the International Mountain Biking Association, said he is amazed at the development of the trail system, noting that just a few years ago the region was barely a blip on the national radar. "When you look at places mountain bikers are going there are a couple of things that are really important," Williamson said. "Obviously great places to ride, the reputation it has, the distance and how long they can stay. And really the dynamic nature of the trails, the diversity of the actual riding experience. "So there are lots of different trail types. Some might not be appealing to some and some may be to others. 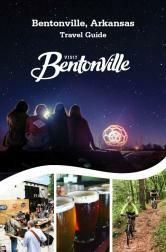 Bentonville and Northwest Arkansas really are amazing in the fact that it is the full package," he said.